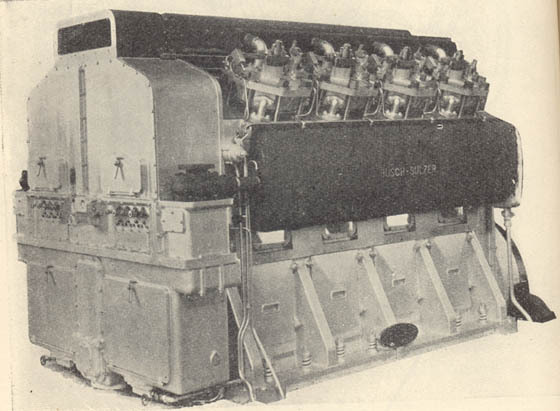 A 1936 2,000hp Busch-Sulzer demonstrator, ICRR 9201, powered by a two-stroke ten cylinder V engine. Maximum speed was 60mph, maximum tractive effort was 85,500lb, weight in working order was 154.5 tons. Although built by the Busch-Sulzer company to all intents and purposes this locomotive had no connection to Sulzer Brothers. 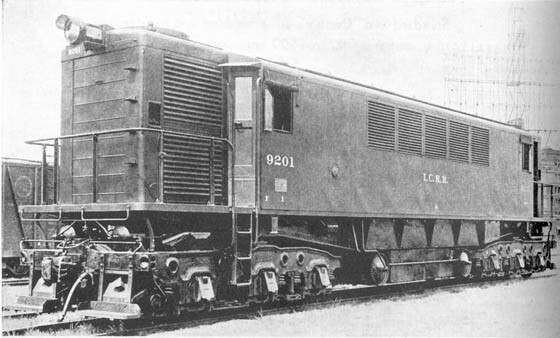 This locomotive was one of three demonstrators supplied to the Illinois Central Railroad, the second was built by Ingersoll-Rand, utilising two of their 900hp four-stroke engines direct coupled to two International G.E.C. d.c. generators which provided power to the tractions motors. Maximum speed was 60mph, maximum tractive effort was 80,000lb, weight in working order was 143 tons. A third locomotive was powered by two Winton engines providing 1,800hp total. On October 9th 1897 beer magnate Adolphus Busch of St Louis, Missouri signed a licence agreement with Rudolf Diesel with rights for building diesel engines in the USA and Canada. Following on from the agreement Busch founded the Diesel Motor Company on January 4th 1898 in New York. In 1902, a successor company to the Diesel Motor Co was created by Busch and the International Power Company, namely the American Diesel Engine Company. In 1908, Busch acquired all assets of this company and became its sole proprietor moving the company to St Louis. On December 7th 1910 Adolphus Busch and Sulzer Brothers entered into an agreement to form a joint venture as a successor to the American Diesel Engine Company. Rudolf Diesel joined the venture in the following year, so creating the Busch-Sulzer Brothers-Diesel Engine Co. Busch contributed his American Diesel Engine Company interests, Sulzer assigned their US and Canadian rights together with drawings for two- and four-stroke engines, and Diesel contributed his US patents. A licence was granted to the new company by Sulzer Brothers in April 1911. 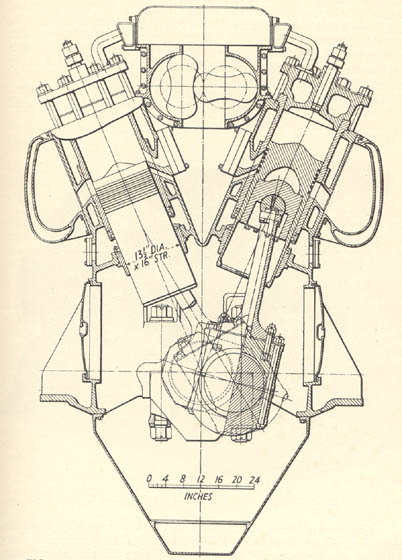 The engines built by Busch-Sulzer appeared to have relied little on Sulzer designs. They were designed in the USA, though based on Sulzer patents. Busch-Sulzer concentrated on diesel engines for the marine & stationary power plant (public utility) markets. During World War One the US Navy Department asked Busch-Sulzer to design & construct several types & sizes of diesel engines, upto 2,500hp, for use in submarines. Such was the demand that the entire plant was turned over to this task during World War I. The Sulzer licence expired in 1926, though the involvement of Sulzer in Busch-Sulzer may have ended well before that date. After 1926, the Busch-Sulzer engines cannot be regarded as Sulzer engines. The name of the company, however, has long led to the misconception that there was some connection, especially as Busch-Sulzer was still actively building diesel engines until 1946 when the company was bought by Nordberg. (In normal practice, engines are referred to by the names of "licensee-licensor" joined by a hyphen. Thus it is easy to see how confusion can creep in when the US company name was "Busch-Sulzer"). Busch-Sulzer only started developing and building rail traction engines in 1932. The company supplied an engine in 1936 for the experimental diesel-electric locomotive which is featured at the head of this page, though it must be clearly pointed out that the only Sulzer connection to this locomotive was the 'Busch Sulzer' nameplate carried by the power unit (see picture below). A view of the two-stroke eight cylinder V engine. At the end of 1933 Busch-Sulzer Brothers-Diesel Engine Corporation USA produced an eight cylinder two-stroke V engine of 1,600hp followed by a ten cylinder unit developing 2,000hp. The cylinders have a bore of 13.5in and a stroke of 16in, the rated speed is 550rpm. The crankcase and cylinder block are formed in a single casting, a large sump is attached underneath. The portion of the cylinder block located between the two cylinder banks serves as a distributing reservoir for the scavenging air, the blower is mounted above this. Please note that this power unit bears no resemblance to any Sulzer Brothers power unit supplied for rail traction purposes. Demands of a similar nature occurred during World War Two, with diesel engines being supplied for use by the Army, Navy & Merchant Marine. In 1946 Busch-Sulzer was acquired by the Nordberg Manufacturing Company, Milwaukee, Wisconsin. * 1935: ALCO's licence was for marine and stationary engines but had an option for traction engines which was not taken up. * 1964: Nordberg, though no engines appear to have been built under that agreement. * 1980: Waukesha used the licence for stationary engines. In February 1979 Morrison Knudsen acquired retired Union Pacific GP9 278 (new Sept 1954 - retired May 1978, builders #19875). It was rebuilt using a six cylinder 6-ASL 25/30 1,500hp Sulzer engine and was renumbered MK5001 - MK model TE50-4S. It spent time on lease in Canada, and on the Boston & Albany RR, Conrail, Chicago & North Western, Maine Central & Washington Union Terminal. The distinctive livery and markings leave no doubt as to the owner of MK5001. Morrison Knudsen (M-K) had embarked on a search for a replacement of the GE FDL model, the search was of an international nature. Their interest in Sulzer Brothers lay with Sulzer's highly fuel efficient engines and their proven use in the European market. Regretably the use of the Sulzer engines in the USA ended badly and M-K transitioned to Caterpillar engines, generally with more success, although the MK5000 series wound up having many of the same issues as the Sulzers did. During 1978 the Southern Pacific took delivery of four new four axle models, the GP40-2, GP40X, B30-7 & MK's TE70-4S. This gave SP the chance to evaluate the new Sulzer powered locomotives against similar new machines. Morrison Knudsen had acquired four retired General Electric U25B units from SP (numbers 6717, 6733, 6745 & 6752), the trucks, frames and cabs would be reused in the rebuild. They were fitted with a Sulzer 8ASL 25/30 power unit becoming model TE70-4S in MK's terminology. The locomotives were outshopped in a striking livery, reminiscent of the 'Daylight' livery found elsewhere on the SP. The 'Popsicle' liveried locomotives would spend their careers working out of California & Oregon, the Roseville freight pool being their home depot. After several years of solid service they were taken out of service and stored at several locations prior to being moved to Oakland and parked awaiting possible sale of their power units. Displaying their unique 'popsicle' livery the four units sit stored at Eugene, Oregon in August 1986 awaiting an uncertain fate. Four ATSF SD45's were selected for the replacement of their EMD 645 V20 power units by Sulzer 16-ASV25/30 power units, rated at 3,600hp. These locomotives were delivered to Morrison Knudsen's facility at Boise, Idaho for the rebuild, they were designated by MK as Model TE83-6S. Much of the remanufacturing work was handled by the ATSF shops at San Bernadino, California, the power units were installed at Boise. The width of the Sulzer engine required the hood to be widened by about two inches adjacent to the power unit. When released from Boise the locomotives sported Southern Pacific style numbers on the cabsides and number boards. The locomotives did not do well, being plagued with problems spending much of their time in the shops. Two returned to Morrison Knudsen for modifications, but the project was soon abandoned and the units stored prior to the re-installation of the EMD 645 V20 power units during 1985. Seven years after the re-engining of ATSF 5406 from its Sulzer prime mover back to its more normal EMD645 V20 5406 leads a westbound through Cajon Pass on Valentine's Day 1992. It has lost its modified hood that was two inches wider to accomodate the Sulzer engine. Of the ten Sulzer ASV25/30 V 16's installed at Morrison Knudsen, it was Union Pacific 60 which was the first to be completed in July 1980. This machine had been stored out of service at Salt Lake City and was moved to MK Boise late in 1979. All bodywork alterations for this machine were carried out by MK, the other conversions were carried out at the UP shops at Omaha, the locomotives then transferred to Boise for final installation of the power units. As with the ATSF units the hood was widened by two inches to accomodate the larger power unit, the two inches were stepped out at the cab end but tapered at the other end. Because of the location of the two turbochargers the combustion air could not be drawn easily from the clean air compartment. The last carbody door was removed and a new primary air filter was installed. A new wall was installed in the carbody behind the air compressor and the engine air filter located above the compressor to draw air out of the new intake compartment. This alteration was carried out only on the left side of the locomotive. The locomotive weight remained about the same, as did the horsepower, 3,600hp at 900rpm, utilising the original AR10 generator. The locomotives were worked east to North Platte for painting and renumbering, then back to Salt Lake City for final adjustments by MK personnel prior to entering service. The UP shops at Salt Lake City were the major maintenance point for these machines. The distinctive Sulzer sound was likened to an Alco 251 when under load, the crews liked them for their pulling power. Teething troubles were such that the first five machines by the end of 1981 had been stored at Salt Lake City prior to the delivery of the sixth example, UP65. This last machine remained operational in 1982, serving as an engineering testbed in an attempt by the MK personnel to make the Sulzer's roadworthy in the US operating environment. The continued tests were eventually terminated by MK, UP65 returned to Salt Lake City joining the other five in storage, all were retired in December 1983. The problems that affected the ATSF & UP units related primarily to inadequate engine cooling and high lube oil temperatures related to the tight clearances of the rotating parts. There was also high usage of aluminium main and rod bearings. To rebuild the engine would cost about $140,000. One feature that received favourable comment was the Sulzer twin turbocharger design, making for a very clean exhaust. They were eventually moved to Council Bluffs and were later sold to Precision National, Mt Vernon, Illinois in October 1987. They remained here for over ten years, even surviving the bankruptcy of their new owners. National Railway Equipment eventually acquired the assets of PNC, later negotiating a rebuild program that would send remnants of these former Sulzer powered locomotives back to the Union Pacific as SD40-2's. Originally the intention was only to salvage the frame and trucks but the hoods were also retained as a cost saving measure, the distinctive flared radiator cowls easily revealing their heritage. Shown here is UP60 at Ogden on July 29th 1983, the first of the UP 'Sulzers' to enter service. Clearly visible here is the two inch step-out to accomodate the wider Sulzer power unit. UP60 seen here on July 12th 1983 withdrawn at Salt Lake City. Clearly visible is the 16cyl ASV 25/30 power unit. Visible also is the modification at the rear of the hood incorporating the repositioned air filter. Photograph courtesy Don Strack from Extra 2200 South. Union Pacific 1977-1980, George R Cockle, pub Overland Models Inc.